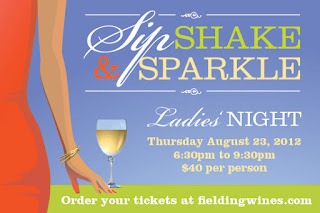 Grab your girlfriends and head to Beamsville for the Fielding Estate Winery's annual summer ‘Ladies Night’ on Thursday August 23, 2012 from 6:30 – 9:30pm. The Chandeliers and Champagne girls are all about girl time and this makes for the perfect evening to enjoy new summer wines & cheese, dance to live music by Troy Western and view the 2012 jewellery collection from Deanna Roberts of Uniquely Yours Jewellery. Jeremy Parsons, Canada's favourite "Mixologist" and the auditor of his entertaining tips book "Cold Tea at Three" will be shaking some tasty wine inspired cocktails throughout the evening! 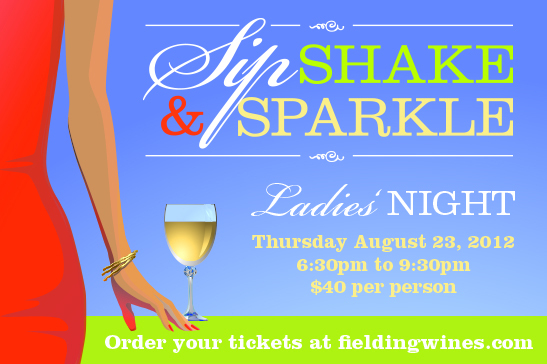 “This is a great night of girl-time fun to enjoy before the kids are back in school and the craziness of September begins,” said Heidi Fielding of Fielding Winery. “Ladies Night is always lots of fun, and it’s a great value – you can’t beat that!” The event supports GO GIRLS a charitable company whose programs are designed to encourage girls to participate in physical activity, make healthy eating choices, and develop a positive self image for girls ages 11-14. 10% of the nights' proceeds will go to Niagara’s ‘Go Girls! Healthy Bodies, Healthy Minds’ program. Included in your ticket is your first glass of wine, one cocktail by Jeremy Parsons, a bottle of our 2011 Fireside White to take home, light fare and $10 OFF any $50 or more purchase from Uniquely Yours Jewellery.